I think, my favorite longboard in my collection is my daily cruiser. It’s nimble and comfortable to skate. It’s so much fun to ride that I look forward to skating it day after day. It’s definitely brought a lot of joy into my life. Commuting on your longboard is a really great way to get around and I highly recommend it. It’s healthy, low cost, environmentally friendly and it keeps you fit. Today I’ll be going over how to pick your first commuter longboard; what you should look out for as you do so. I also touch on what you should avoid, so after reading the article, you’ll know what features will make a cruiserboard great and which features will make it skate poorly. Check it out below. Coming in at 28.5in long and 7.5in wide, this deck is tiny. It has Bear tkp trucks and 63mm tall Hawgs wheels. Given that the deck is so small, you’ll find that it is very maneuverable and super fun to ride. However, it will be a bit harder to ride for long periods of time, and it will feel uncomfortable after a while because of it’s narrow size. I mostly recommend it if you’re using it to cross small distances, but not if you’re using it to push a couple blocks. It makes the perfect campus cruiser but not a long distance commuter. For a long distance pusher, check out the Landy switch below. The small size of the Dinghy also makes it super portable. You can put in a suitcase, in your locker, it will fit easily under your desk at school and it won’t weigh much so it will be easy to carry around. It is the perfect alternative to the Penny board, infact it’s better for the environment if you buy it. I also think it’s a great size for kids. With their small feet and small stature, they will be able to enjoy this board to the max. You get a lot of awesome customization options if you buy it so you can find the graphic and color scheme that works for you, check it out on here on Amazon.com. Firstly, no I’m not sponsored by Landyachtz. They simply make great decks and it’s why both the Dinghy and Switch are in this review. 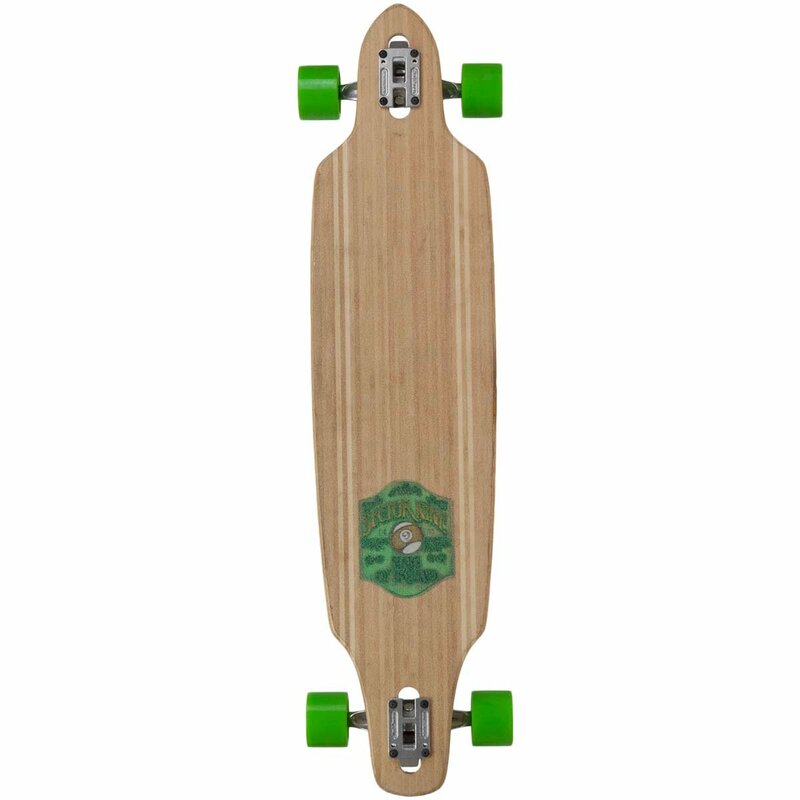 The Landyachtz Switch is a drop down longboard that is perfect for commuting. There are two options available, a 35in and 40in deck lengths. I highly recommend the smaller 35in option, it will weigh less and be easier to push around/carry. But for something even smaller, check out the Dinghy. The setup comes stock with 70mm, 82a Mini monster Hawgs and 180mm Bear 852 trucks. The trucks will be turny and responsive but still feel stable as you pick up speed. The wheels will roll well, but I recommend replacing them with some taller ones to get a better ride and more momentum as you go along. The most important feature of this setup is the drop down deck. This feature will make it easier to skate, push, footbrake and will allow the skateboard to be more stable at higher speeds. Something like this is perfect for beginners and also perfect for those who want something super easy to ride. Check it out on Amazon.com. The deck is made from 9ply’s of maple so will be stiff. Because of this stiffness, you’ll feel a bit of road vibration as you skate, however, if you get taller wheels they will smoothen out the ride and make it more comfortable. The deck also has concave which is designed to kinda lock your feet in, but it isn’t super aggressive. The problem is it will feel awkward and uncomfortable the first time you skate it. However, you will get used to it and be able to ride it easy. But for more comfort, the longer 40in switch will be more better to ride than the smaller 35in one, but it won’t be as maneuverable. This is the only drop through skateboard on my list. I personally don’t like drop throughs, but other people do and that’s why this is here. The main feature of this setup is the flexy drop through deck. The flexiness is perfect for commuting and getting around. Think of it like the suspension in your car. This suspension helps absorb road vibration and makes it kinder on your feet to go on rougher roads and over cabro like surfaces. This is super useful for commuting and makes it more enjoyable to ride your skateboard. It makes the ride really comfortable. Finally, being drop through it will be easier to push and footbrake. However, it will feel a bit sluggish or slow to turn which is actually the main reasons I dislike drop through boards. I like something that responds immediately to my input as a rider. For something like that, check out the Landy Switch or the Karnage cruiser below. The setup also comes with 10in (180mm) Gullwing chargers and 74mm, 78a Sector 9 top shelf wheels. The wheels are the tallest on my list, this means they are the best for commuting. A tall wheel typically smoothens out the ride and makes it easy to ride on a majority of surfaces. It also means things like pebbles, cracks etc. won’t affect you as much (or at all). Also, the 78a softness of the wheel will also help absorb any road vibration. Paired with the flexy deck, you are gonna get a super smooth ride out of this setup. Check it out here on Amazon.com. Another option is simply putting together your own board. It’s not hard when you have nifty guide (like this one) to hold your hand through the process. The deck should be a drop down. This is so you can push behind your wheels and still have good leverage for turning. The low height of drop downs also make them easy to push and footbrake on. The deck I recommend is the Pantheon ember or Trip. Both are great flexy drop down longboards. Perfect for commuting! I would also recommend a shorter board for some advanced riders. The problem with most boards like the Penny is they are narrow and thusly uncomfortable to ride. If you get a wide but small board, you’re in the money. Check out my recommendation for this on amazon.com. It’s a simple wide skateboard deck. Honestly, super comfortable to skate everyday and I use the exact same one for my own commuter cruiserboard. For trucks I recommend 150mm Paris trucks. These will be quick turning, smooth and fun to ride. They will literally make your feet happy. I use the same on my commuter board and you should check them out on Amazon here. Otherwise, I recommend you try get trucks that will match the width of your board. Paris 180mm are a good option for wider decks too. For excellent rolling, good momentum and a smooth ride. I recommend big 70mm+ wheels. Some favorites of mine are wheels like the Otang Kegels, check em out on Amazon. Alternatively, you can get big wheels that offer a supremely premium soft ride and the ability to roll over big rocks (and small creatures) like it’s nothing. 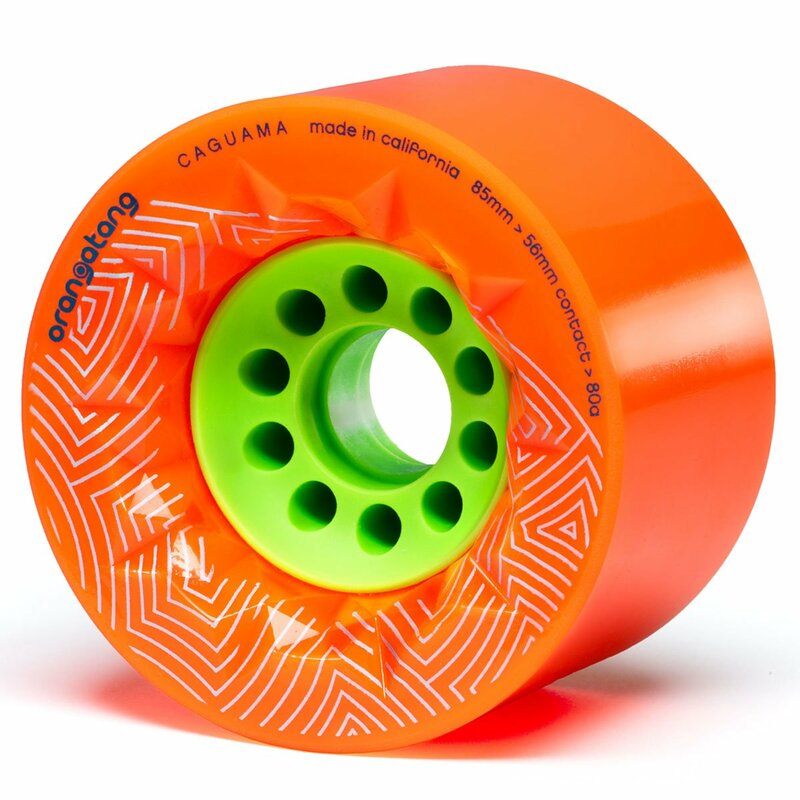 You can get the Orangatang Cuagamas. At 85mm tall these wheels are monstrous and formidable, check them out on Amazon. Otherwise, any other 70mm+ wheel would do fine. At about half the price of some of the other competes on my list, the Karnage cruiser has all the makings of a perfect commuter longboard. It has a drop deck for an easy ride, with rkp trucks for maneuverability and 70mm tall wheels for a smooth ride. Where it fails, is that it uses low-quality parts. This affects how it will perform. 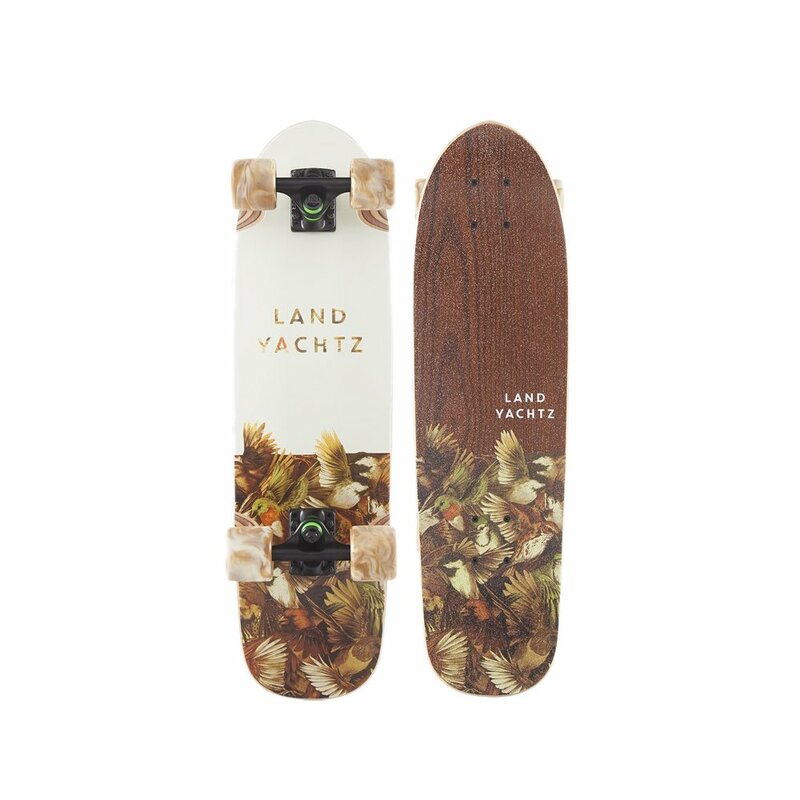 The deck won’t feel as ergonomic and comfortable to skate as the Landyachtz switch deck will and the truck won’t turn as smoothly as some of the others on my list. That being said, a few cheap after-market parts can make this longboard feel a lot better. If you buy some new bushings for your trucks and some foam grip, it will feel a little bit nicer to ride. You can also replace the trucks altogether for smoother more enjoyable turning. There is nothing embarrassing about buying a cheap deck, we all have to start somewhere. I personally started on a cheap Amazon cruiser and slowly upgraded the parts one by one. It was worth the experience and I felt the difference each change I made to my setup felt. You can check out this skateboard on amazon.com. So whilst the deck becomes personal preference once you get good enough. The most important things that follow are the wheels. Big soft wheels are great because they roll over things easily and absorb a lot of road vibration, giving you that smooth cloudy feeling ride that is kind on your feet. However, if they are too big and soft, they feel really sluggish. So we have to go with wheels that have big cores like the Kegels, Seismic Alphas, Seismic speed vents etc. For a fast roll speed (and a little bit of weight reduction too). Wheels around 70mm will be decent too. The trucks, bearings and grip don’t matter sooo much. 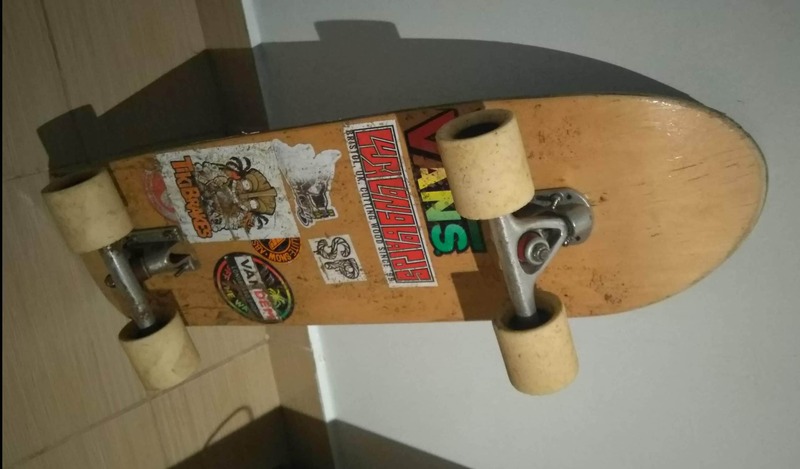 Just get decent beginner trucks like Caliber or Paris, fine griptape and some decent/cheap bearings and you’re good to go. Finally, lets look at the deck. If you are a beginner picking your first deck, you want something a bit longer because it will be stable and easy to ride. Though, that doesn’t mean you can’t have a short cruiser deck. Short cruiser decks are a bit harder to ride, but they are easier to carry around and store. The secret is getting one that is 9inches or wider. Small, narrow boards like the Penny are really uncomfortable to ride for long periods, and it is because you can place your foot across without your toe or heel hanging off. You want a board that can accommodate the length of your feet. Drop down cruisers are easier to ride, push and footbreak. They are also really stable. This is because of how low the standing platform is. It makes it easier to do all the above. Drop through cruisers are the same, but they don’t ride and turn as well as drop down boards. Top mount cruisers turn the best but are the hardest to push and foot brake on … they are the funnest to ride in my opinion though. Which is what you want, something you have fun riding. The drop down ones are also really fun too, but won’t be as responsive as the topmounts. I recommend beginners stick to the drop downs and more advanced riders try out the top mounts. For my commuter board, I have a generic 9.5in pool skateboard for my deck (with a 14in wheelbase), fine grip, 150mm Paris trucks and an assortment of wheels. If I want to be strictly commuting, I use my 75mm tall 74a Cult raptures. They are really wide and soft, so they absorb a lot of road vibration. They are also tall so they roll super well and literally roll over everything. For other stuff I have tall freeride wheels (nothing below 70mm) that allow me to bust out slides every now and then. Helps to slow down or just when I want to have a bit of fun. Most people who ride it comment on how comfortable and absolutely love it! Below is a video of me, messing around on it. I love that thing! If you are a bit hesitant, I recommend the Landyachtz switch. It will be a great high-quality beginner board that you can rely on to perform well. If you’re ‘advanced’, putting together your own board is really fun and fulfilling. I recommend you follow my guide as a rule of thumb (but definitely experiment and pick what suits you/what you like) and you’ll be able to get something that works perfectly for you. Hmmm. Maybe it’s cause you’re using an Iphone 4?